This article details how to use Open Broadcast Software (OBS) to send your video stream to the Field59 live stream platform. Before you download OBS, first check that the computer you are installing it on has the required specs. Any modern — or even not so modern — computer can live stream. At a minimum, you need an inexpensive video card, and we recommend at least 1 GB of RAM. You also need to be able to connect to the computer the camera you are using, and to an Internet connection. We recommend a wired Internet connection, although you can also stream over wifi or data. 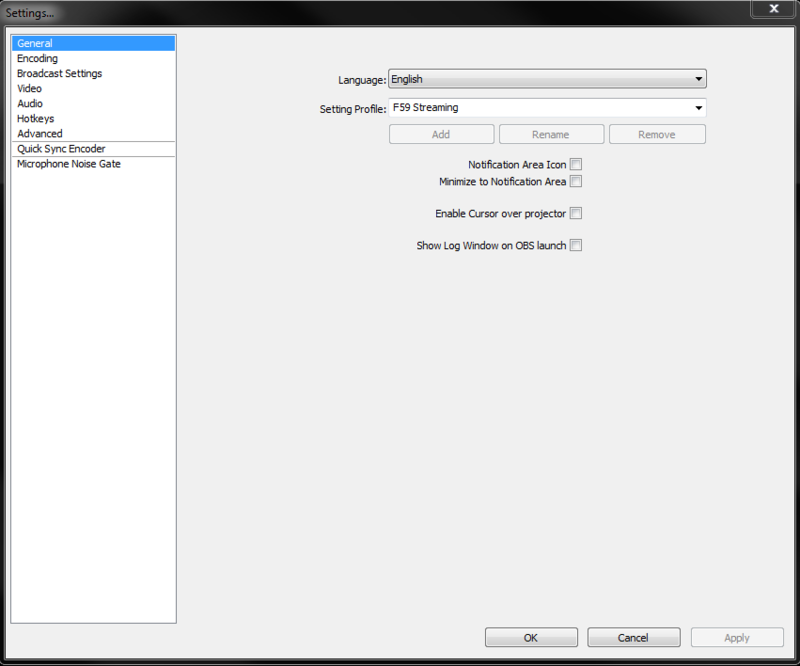 Once you have that set up and OBS installed, here are our recommended settings. 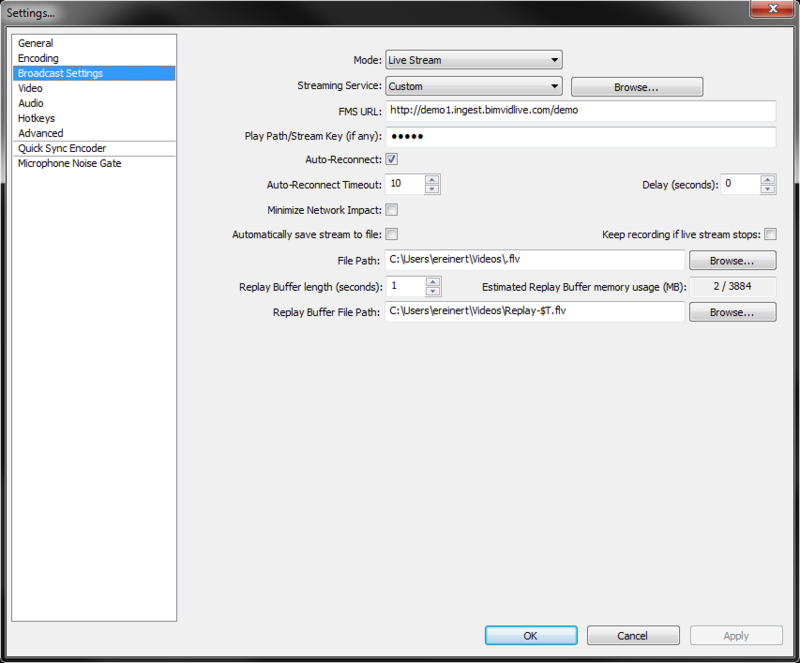 Before you can begin streaming, you must first adjust some of the settings in OBS. To open the Settings area, just click the Settings button. From there, click the following tabs and make the appropriate adjustments in each one. In the Setting Profile field, enter “Live Streaming” (or another title that you will recall is the profile for your stream when returning to the encoder later) and click the Add button. 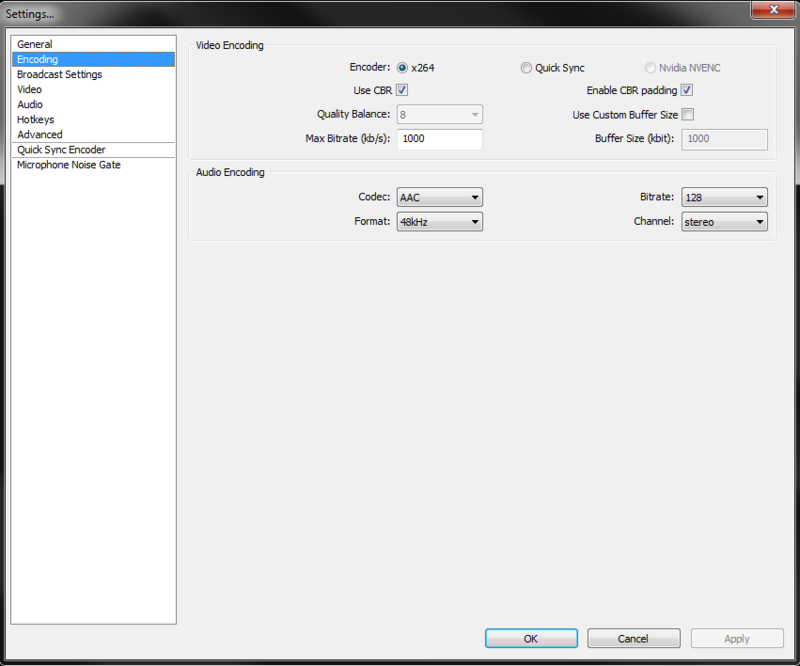 The Max Bitrate field will determine the maximum video quality output for your stream. 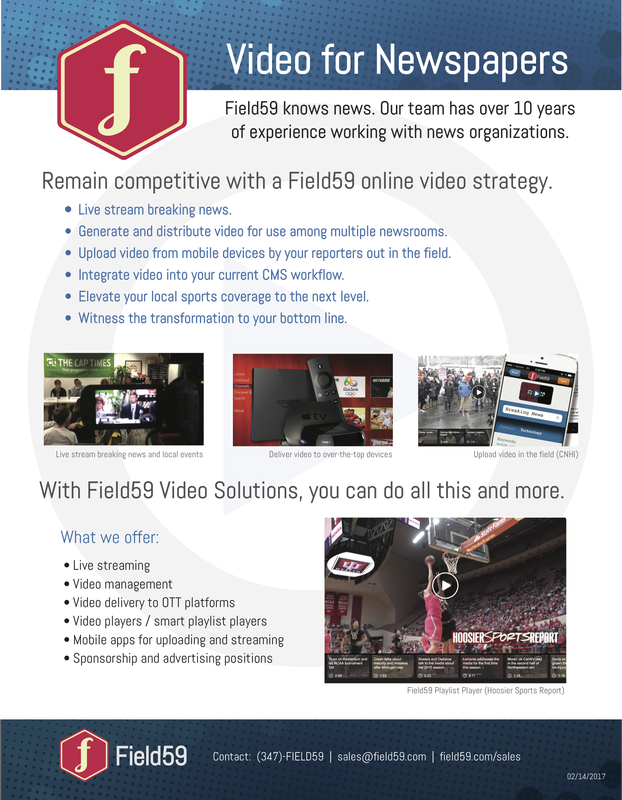 This number can vary depending on your setup and desired video quality. Standard Definition (SD) signal: 500 Kbps is a good starting point for most broadcasts on smaller players. If you want viewers to watch at full screen on a larger monitor or connected television, you’ll want to make this larger. High Definition (HD) video signal: 1000 Kbps (1 Mbps) is a good starting point for most broadcasts on smaller players. For viewers going full screen or watching a program with lots of movement, we recommend 1,500 Kbps (1.5 Mbps) for SD and up to 3,000 Kbps (3 Mbps) for HD. Please check the bandwidth available at your location before making this setting — you should be careful not to exceed the bandwidth available to you at your location, or the stream will have difficulty getting to our cloud platform for transcoding and distribution. 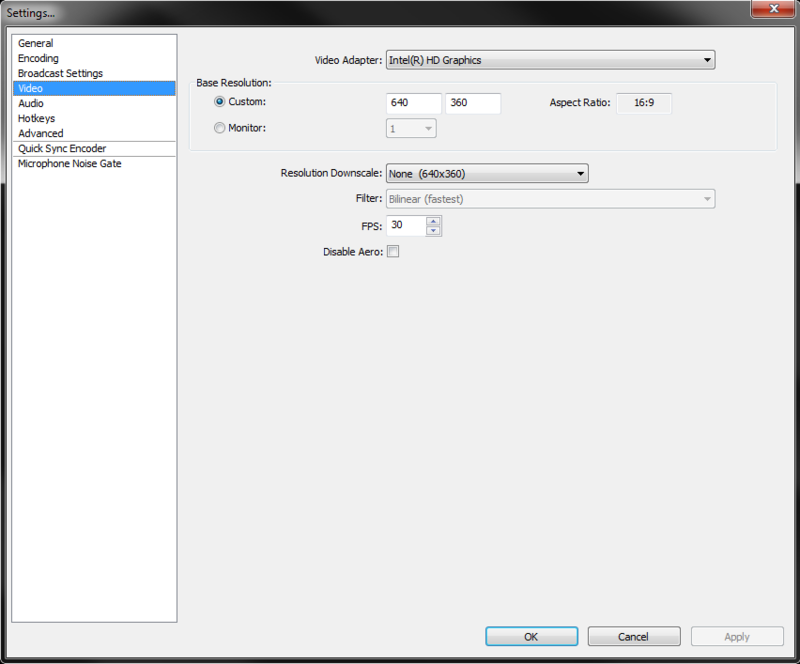 For the Base Resolution setting, we recommend 640×360 at minimum. (This is also the size of our default player when embedded on a page if the player is not set to be responsive.) Larger resolutions paired with higher bitrates will look better on larger screens, but will use more bandwidth. For HD streaming a resolution of 1280×720 would be a good bet. Make sure the Resolution Downscale drop-down is set to None. 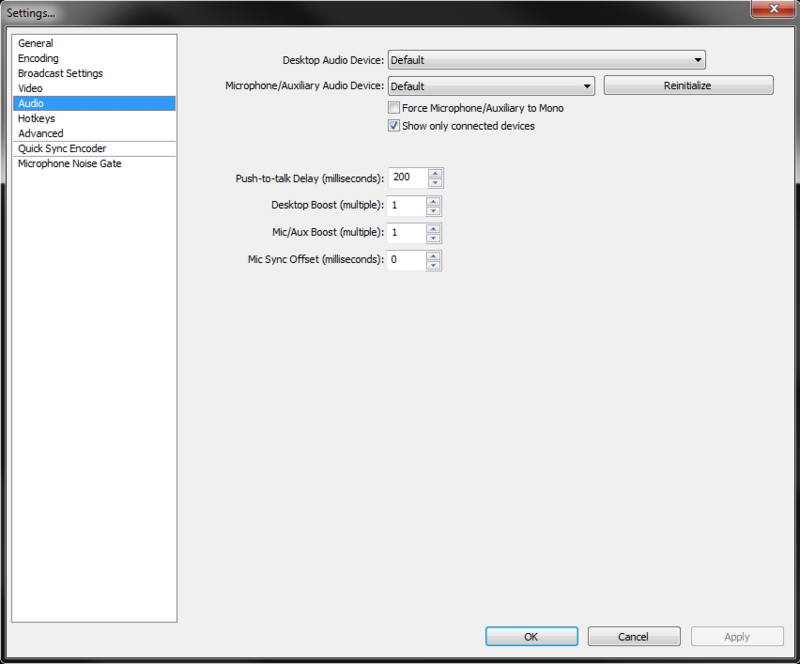 Your existing source audio options should auto-populate here. This does not need to be the built in mic to your camera if you have other audio sources connected. You can select an alternate audio input. 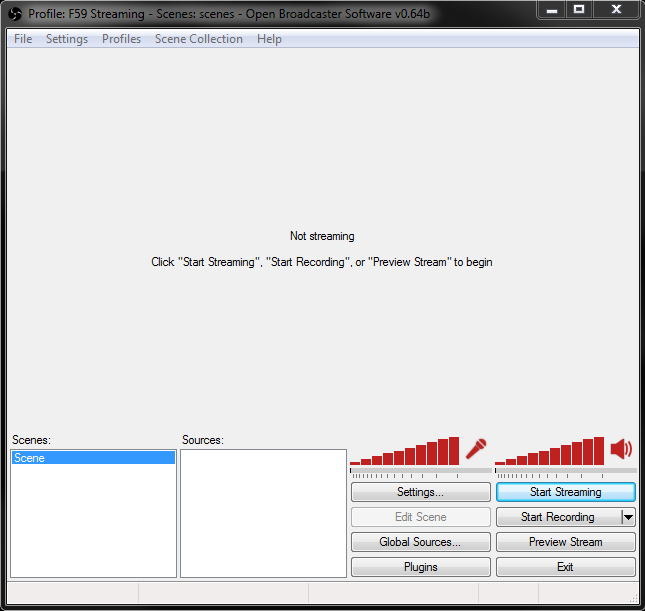 After you’ve configured the OBS settings to the required specs, you can begin streaming by clicking the Start Streaming button. This will send the stream to Field59’s ingest servers. The stream will appear in the player for any active Live Events (or Live Channels if the channel player contains an active Live Event) that you have configured in the Field59 video platform to use your stream.